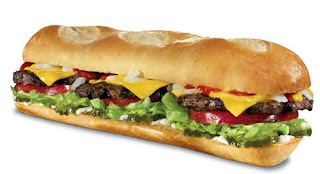 Some Carl's Jr. locations in Southern California and Hardee's locations in Indiana are testing a new foot-long burger with 850 calories and 20 grams of saturated fat. The 'burger' includes 3 beef patties and 3 slices of cheese on a 12-inch hoagie-type bun. It is being sold for $4, or $4.50 for the 'deluxe' version with more toppings (lettuce, tomato and such).